thompsondockside.com • View topic - pink!! really? my 1957 seacoaster deluxe (model 477) was painted dusty rose (my wife says it was pink). I have found traces of it everywhere! well, I'm not about to paint the whole boat dusty rose again. however, I would like to paint it that color below the waterline - a concession to it being a historical artifact. does anyone know of a source for such a paint? or if I were to purchase, for example, a can of interluxe Brightside in white and have it tinted at the home depot would that work? if you can help, it would be much appreciated. 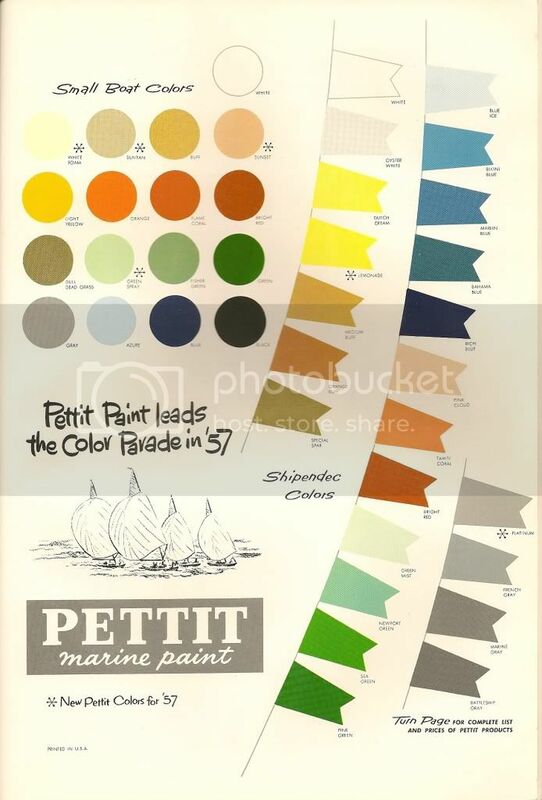 See the colour chart from Pettit for 1957. Thompson Bros. Boat used a number of these pastel tones as standard for the boats that year. Look at the '57 Thompson brochure to determine which colours were utilized. George Kirby, Jr. paint Co. of New Bedford, Mass can match almost anything. They most likely have this chart. Tell George Kirby IV that I sent you.